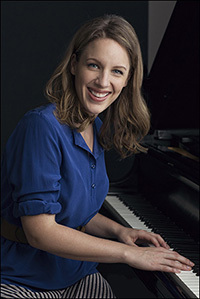 I also had the pleasure of chatting with Jessie Mueller, who stars in the title role of Beautiful, the morning of the Tony nominations. The multi-talented artist, a 2014 Tony nominee in the category of Best Leading Actress in a Musical, was previously Tony-nominated for her work in the 2011 revival of On a Clear Day You Can See Forever. Since that time, the Illinois native has moved from one high-profile project to the next: Cinderella in the Public Theater's outdoor production of Into the Woods; Kelli O'Hara's successor as Billie Bendix opposite Matthew Broderick in Nice Work If You Can Get It; and Helena Landless in Roundabout Theatre Company's critically acclaimed revival of The Mystery of Edwin Drood. And, now, Mueller is taking center stage as famed, Grammy-winning singer-songwriter Carole King. My brief Tony Nominations Day chat with the actress follows. Question: How did you find out about the nomination? 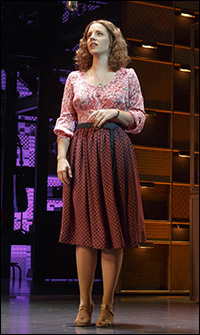 Jessie Mueller: I was actually watching with one of my best friends. He called me the other day and said, "Hey, want to get together Tuesday morning? I'll bring bagels. Maybe we should watch." I said, "Sure, let's do it!" Question: What was your reaction to hearing that you had been nominated? Mueller: I was very happy, and I jumped off my couch when I heard Jarrod Spector's name announced, and then I jumped up and down again when they called Anika's name. I'm just really happy that the whole show is being recognized in the way it is because it's such a labor of love for us… It's just so great, and I love [that] orchestration and sound design [were also nominated] because it all happens together, and we all do it collectively, so it's even sweeter when the whole group gets recognized like that. Question: There were so many new musicals this season — it must be very gratifying that Beautiful received a nomination in the Best New Musical category as well. Mueller: Absolutely. I haven't gotten to see everything yet, but I saw After Midnight, and it's just fantastic. I've only heard wonderful things about the other two shows… It's cool, too, that these are new shows, and they're all very, very different, and I think that's such a great thing. Question: What was the biggest challenge of the project, especially when you're playing someone who is so well known and someone who is still alive? Mueller: I think at the core of it was just upholding the integrity of it. Every decision that we all made and that the creative team made [was] always very driven by that sort of core value. That we have the integrity at stake of these four writers that are living and working and still doing their art, and so it's important to represent them in an honest way, and we wanted the show to be entertaining, but we had a lot at stake. Question: You had an especially exciting night about two weeks ago. What was your reaction to seeing Carole King come onstage, and how have you sort of filtered that experience since then? Mueller: It took me a second for it to kind of sink it. I saw her and I was like, "She's here." And the second thought was, "Oh my God, she's here because she just saw it." [Laughs.] So then my mind was going, "How was my singing? How did it sound?" But she looked so happy. And there was the recognition that she wouldn't come out [onstage] if she wasn't happy and she wasn't pleased and she didn't feel like she was represented in the way that she wanted. I was also just gratified that she was able to come see it in the way that she wanted to and that she felt comfortable. That she feels proud of it now is such a wonderful thing to live with every day. Question: What's been the most gratifying aspect of playing this role in the show? Mueller: I think it's the collective thing with everybody of the feeling that we create with the show. You see people at the stage door after, and they're so happy. It brings back so many memories for some people. For some people they're newly exposed to this music and this era. So many things were happening socially and in the country, but the music was such a representation of that and there was such an authenticity to the music. And, it was the birth of rock-and-roll as rock-and-roll was taking over. It was a huge moment in time, and it's so fun to see people's reactions to that. 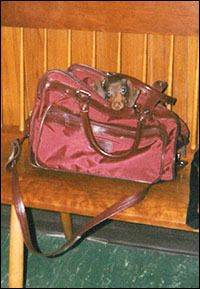 I wanted to dedicate this week's column to my beloved dachshund, Gilligan, who I lost last Friday, two weeks short of his 14th birthday. My little buddy, whose jovial spirit was contagious, died in my arms after a month-long illness. He spent many hours on my lap as I wrote this column and never seemed to mind listening to the countless renditions of "With One Look," "Rainbow High," "Unexpected Song," "Rose's Turn" and "Meadowlark" that played in my various apartments over the years. And, whether he was running in crazy circles around the room, lovingly looking back at me during a walk to make sure I was still on the other end of the leash, staking the six inches under the bed as his own personal space or surreptitiously drinking from my glass of water during the night, Gill made me laugh most every day of his life. In fact, I have dozens of anecdotes about this colorful canine that I won't bore you with, as I realize he was probably neither greater nor lesser than other dogs; he was simply mine. The only thing Gilligan ever truly wanted was love (and chicken and bacon and, yes, the occasional cheeseburger), and he gave it back exponentially. Rest in peace my friend, you deserve it. I will see you again someday on the other side. My favorite picture of Gilligan.